Are you suffering from insomnia or some other sleeping disorder? Did you know there are different types of insomnia and there are actually more than 80 know sleeping disorders? You could be suffering from more than one! Find out how to get a good night's rest now with our eBook! The optimal room temperature for sleeping. How to prepare your bedroom for sleeping. Things to do before going to bed. Why you should forget your worries before sleeping. What foods to eat that will help you to fall asleep. What it means to dream. How important a sleep schedule can be. How Yoga can help prepare you for sleeping. 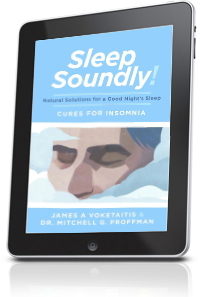 Read Sleep Soundly eBook to learn what you can do! Medications are not the answer! More Americans are turning to medications to help them sleep and not realizing the serious side effects. Some risks of over-the counter medications include drowsiness, dry mouth, and dizziness. Sleeping pills also increase the risk of suicide due to the central nervous system inhibitors that are in these medications. Addiction to prescription drugs can also be a serious problem. Natural alternatives: Exercise, avoid caffeine, take naps, eat food containing melatonin. video links: "What it's like to visit a Chiropractor."